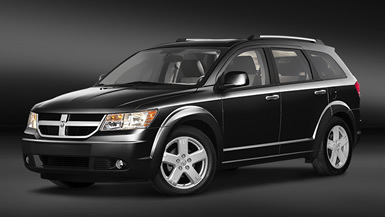 Crossover Review: The new 2009 Dodge Journey may look like a tough SUV, but it's actually a car-based crossover with a practical interior similar to a minivan. If you need a super-practical ride for your family but don't want to be the target of a thousand soccer-mom jokes, Dodge thinks it has the vehicle for you. It's called the Journey. Minivans are perfect for many families. They have a lot of space for passengers, carry plenty of cargo, are easy to enter and exit, get good gas mileage, and drive with the smoothness and precision of a car. There's just one problem. They come with a stigma. This new crossover vehicle is actually more like a minivan than an SUV, but it has a squared-off, aggressive looking body that disguises its very family-friendly layout. It's like camouflage. The outside looks tough like a monster, but on the inside it's like a cuddly little teddy bear. That's where the Journey really shines. While there are lots of good looking, nice driving, crossovers to pick from, the Journey offers a smarter interior than most. There are storage spaces hidden everywhere. It has two glove boxes, one of which is chilled to keep drinks cold, along with storage bins in the floor and even cubbyholes under the seat cushions. It looks like Dodge was trying to make use of every millimeter of available space. The interior can also be packed with technology if you tick enough option boxes. Available goodies include a navigation system, 30-gigabyte hard drive for music storage, a rear-view camera for backing up, Bluetooth phone interface, iPod connector, rear-seat DVD player and satellite TV. Yes, that's right. You can get a few satellite TV channels delivered through the Sirius Satellite Radio system. They're mainly cartoon channels for children, but nonetheless it's an interesting feature, and probably one we'll be seeing on a lot more vehicles soon. The Journey also emphasizes safety, as you'd expect in a family focused vehicle. It earned a five-star rating from the government for both front and side-impact crashes, and it's packed with airbags and electronic systems to keep it stable in emergency maneuvers and minimize the chance of rolling over. It offers decent gas mileage too, especially for such a big vehicle. With the 2.4-liter, 173-horsepower four-cylinder engine, it gets 25 mpg on the highway and 19 mpg in town. And it gets 22 mpg on the highway and 15 mpg in the city if you pick the 3.5-liter, 235-horsepower V6. Better yet, the Journey starts at a surprisingly low price, $19,360. Granted, the fancy options will quickly drive its price higher, but it's good to see the Chrysler company's latest crossover start at a much lower price than its last one, the Pacifica. While the Pacifica was a nicer car than the Journey in some ways, including interior materials and ride refinement, its starting price near $30,000 kept many buyers away. Pricing the Journey under $20,000 was a smart move. In fact, the Journey's greatest weakness is its stiff competition. There are so many crossover SUVs available, some that are bigger, more refined, more powerful, more luxurious, or better looking, that it's tough to make a decision about which one's best. It all depends on what you're looking for. If you want a versatile, usable interior, the Journey ought to be at the top of your list. What was tested? 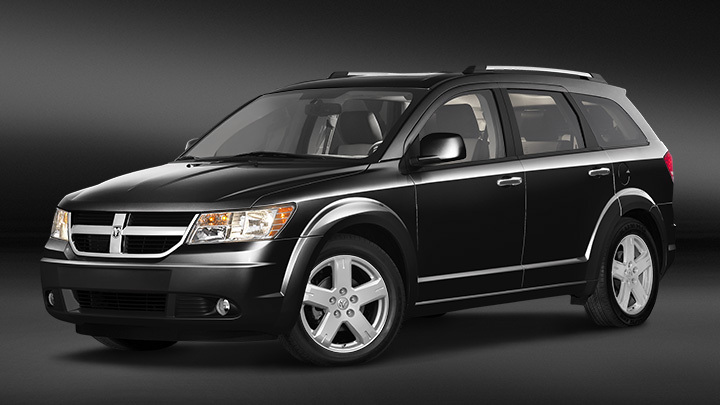 The 2009 Dodge Journey R/T with a base price of $25,920. Options on the test vehicle: Customer preferred package at $695, the flexible seating group at $1,220, the entertainment group at $2,200, rear seat video at $825, the family value group at $295, aluminum wheels at $625. Price as tested including the $625 destination charge: $32,405. Why avoid it? There are a lot of good crossovers for sale today, giving the Journey some tough competition. Why buy it? If you want a versatile, family friendly cabin, it's hard to beat this Dodge. It's filled with hidden storage compartments and amenities for families.